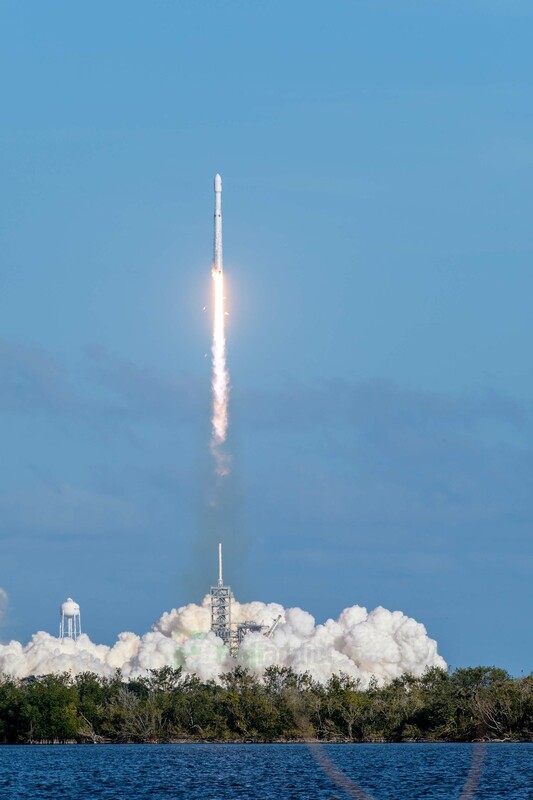 The Falcon Heavy launch was a pretty crazy experience that I will not soon forget. I tried to live stream some of it on Facebook Live, but it kept cutting out. I think a few people caught my launch stream, but if you missed my stream I posted a full video here filmed with the Sony a7RIII. Filming in the Florida Sun isn’t easy and I had to stop the lens down to f/32 since I didn’t have an ND filters for the Sony 100-400mm+1.4xTC, but the footage is pretty solid. For Photography, I decided to frame the rocket in portrait so I could zoom in as much as possible and maintain a roughly 1/3 shot of the rocket going up. I wasn’t sure how big the flame would be coming out of the Falcon Heavy, but I wanted to capture some nice separation. 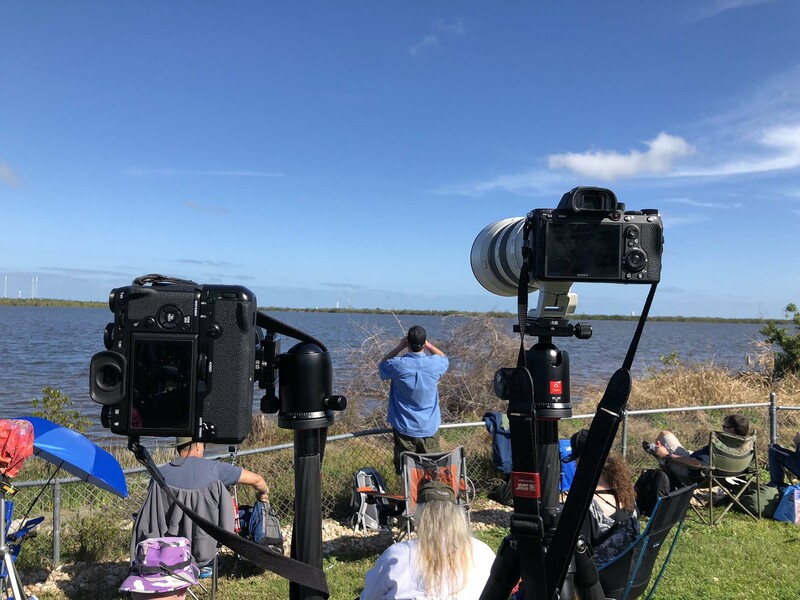 I tried to automate the process as much as possible so I could shoot and film while observing the rocket launch with everyone else since this was the first Falcon Heavy to ever go up. Above you can see the photos all put together as a time-lapse video. I probably could have used my Fujinon 50-140mm + 2xTC to shoot this launch, because the 4-mile viewing platform is a lot closer than the previous one I watched, but the Fujinon 100-400mm +2xTC gave me more freedom. The 4-mile viewing area isn’t necessarily the best place to photograph the launch from because the tower hides the rocket and it took almost 4 hours to get to the site even though we arrived at the suggested time. Some people arrived extremely early and lined up outside so finding a good spot to shoot from was very difficult. I ended up having to shoot my cameras at just below 7 ft in the air and yes I could still see through the Fujifilm X-T2 viewfinder at least. Launch photography is a lot of fun and is uniquely challenging because depending on the angle you shoot from there are atmospheric conditions to take into consideration and when they start fueling the rock there is outgassing around the rocket that causes things to get a little wavy depending on conditions and angle. In the future, I would like to shoot this again at night and maybe arrive 2-3 hours earlier than my placard says to pick a prime spot to shoot from. I think I would keep my equipment pretty much the same as what I brought with me, but maybe I would try the 50-140mm+2xTC with my Fujifilm X-T2. In the coming Days/Weeks I will post more to Instagram / 500px / YouTube so subscribe/follow them if you’re interested in Falcon Heavy and Space X. Also don’t forget to follow Fujiaddict on Facebook and Twitter. This entry was posted in Fuji X-T2 and tagged 100-400, Falcon Heavy, Fuji Rumors, Fuji XT2, Fujifilm, Fujifilm Rumors, Fujifilm X-T2, FujiFilm XF 100-400mm f/4.5-5.6 R LM OIS WR, Fujifilm XF100-400mm, Fujifilm XT2, FujifilmRumors, Fujinon XF 100-400mm f/4.5-5.6 R LM OIS WR, Fujinon XF100-400mm f/4.5-5.6 R LM OIS WR, FUJINON XF100-400mmF4.5-5.6 R LM OIS WR, Fujirumors, Rockets, Sony a7RIII, Space, Space X. Bookmark the permalink. Trackbacks are closed, but you can post a comment.